I have one very distinct memory of the end of summer. We were at a neighbors house – specifically in their pool – which was awesome because we didn’t have a pool and I’d jump at any chance to swim. Lots of people were there, lots of kids, my brothers, neighborhood friends, tons of food and a particular plate of chocolate chip cookies that I was doing a number on. But then it started to get dark. And sort of late. So I got out of the pool. Ran home. Got a shower. And I got in bed. My parents didn’t tell me to. My brothers didn’t follow. And all this time… it was still actually light out. I was such a high-strung, type-A nutjob that even in middle school, I had to run home and ease myself into my 9PM bedtime because I was a massive dork. Ugh! You’re killin’ me smalls. I actually remember lying in my bed with the lights out that night, the tiniest bit of sunlight peeking through the window… and tons of shrills and screams from the kids who were still outside having a blast soaking up every last summery drop, and who consequently had to be dragged home by their parents, kicking and screaming because they were… normal. In the bowl of an electric mixer (or using a hand mixer), beat heavy cream and sugar on medium-high speed until stiff peaks form. Transfer the whipped cream to an separate bowl and stick in the fridge until ready to use. I did not even clean the bowl of my electric mixer and just began mixing the peanut butter mixture. Add the peanut butter and cream cheese to the bowl and beat at medium speed, scraping down the sides a few times until mixture is creamy. Add in powdered sugar and mix until combined, then mix in 2 tablespoons of milk. Remove the whipped cream from the fridge and add 1 cup of it to the peanut butter, folding it in until the mixture turns lighter in color and is mostly combined. 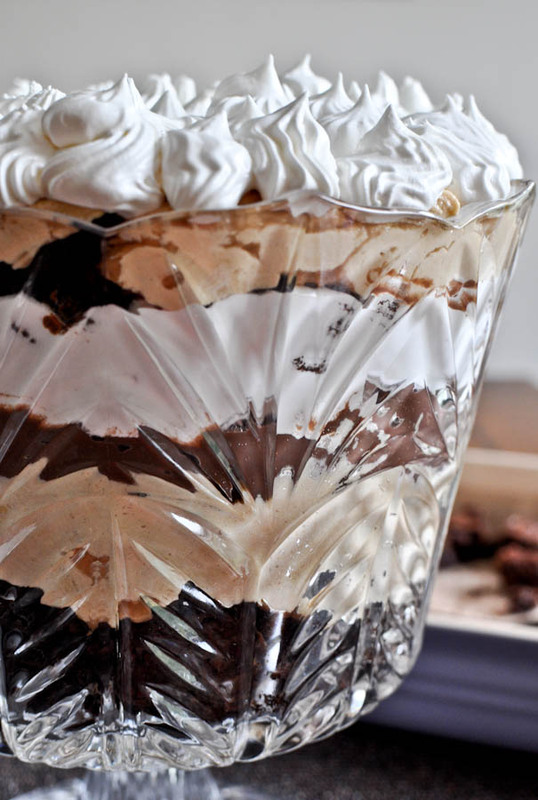 Grab your trifle dish and begin to layer your ingredients however you’d like. I did a layer of brownies, then peanut butter, then a handful of chopped peanut butter cups, chocolate pudding, whipped cream, and so on. I repeated it until I got to the top, then piped the remaining whipped cream on top and sprinkled the candy on. You really can’t go wrong with layering – just use a long spoon to serve! 0 Response to "PEANUT BUTTER FUDGE BROWNIE TRIFLE"